Very fortunate father and husband, with three beautiful children, including one very special daughter with Down Syndrome, and one lovely, patient, and indispensable partner and wife. Our family lives in Atlanta, but we are originally from New Orleans, Louisiana, relocating after Hurricane Katrina to find a better environment in which to raise our kids. The quality of this home and the setting are unique. 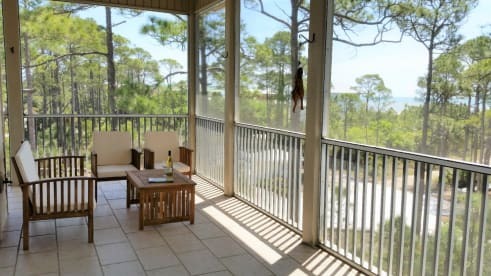 Standing among loblolly pines, the Crescent Palms offers views of the emerald green waters of the Gulf of Mexico through the highest branches of the adjacent pines. Breathtaking is not sufficient; it is a truly unique and remarkable setting for a beach home. The Crescent Pearl is just steps to one of the most pristine beaches in all of North America. The beaches of Cape San Blas never crowded, the sand white and fluffy, and the water is perpetually emerald green. The climate is wonderful, and so is the food, as are the people. You will absolutely love the Cape and the Pearl!